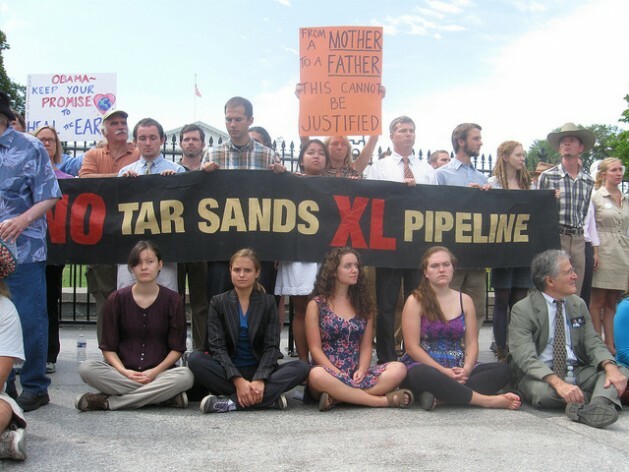 WASHINGTON, Feb 1 2014 (IPS) - The U.S. government has taken a significant step towards approving the Keystone XL oil pipeline, a highly contentious project that has unified environmental groups here in opposition to what they say would be a climate catastrophe. In a widely anticipated move, the State Department late Friday released a final environmental impact statement (EIS) that suggested that the Keystone project, which would bring a particularly dirty form of oil from “tar sands” fields in Canada to refineries in the southern United States, would have negligible effect on climate change. The rationale for this finding was the fact that the Canadian government is particularly motivated to move forward with the project, and thus the tar sands would be developed regardless of whether the U.S. government green-lights the pipeline. Over the past year, for instance, a debate has raged over the viability of moving tar sands oil by rail. But according to multiple analyses, including by the industry, the economic feasibility of the Canadian tar sands development rests on ensuring that the Keystone pipeline gets built. Others are concerned about the potential for leakages and other malfunctions that could occur along the pipeline, potentially impacting on local communities and environments, given the highly corrosive nature of bitumen. Such concerns have made the Keystone project into perhaps the single most defining issue for a U.S. environment community frustrated by national and international failure to act decisively in the fact of climate change. “The environmental community has been asking the president to get serious on climate, and this is the first move he could make to show how serious he is,” Kyle Ash, a senior Washington legislative representative with Greenpeace, an advocacy group, told IPS. To a great degree, the State Department’s new conclusions adhere closely to a draft version of the report released last year and which set off a chorus of outrage from environmentalists. In the intervening months, however, President Obama and some of his top officials made public statements that strengthened the belief for some that the final report may offer different analysis. Yet Greenpeace’s Ash says it shouldn’t be much of a surprise that the report didn’t change significantly. “You have to step back and see how this falls into the White House’s broader climate and energy strategy,” he says. The State Department is keen to emphasise that its final report, about which it received nearly two million comments since 2012, is not a “decisional document” on whether the Keystone XL pipeline should go forward. Following a public-comment period and a 90-day interagency review, the issue will go to President Obama’s desk for a final decision on whether the project would be in the “national interest”. Of course, such vague phrasing offers plenty of fodder for both sides of the discussion over the Keystone pipeline’s merits, and the new State Department report will only feed this process. On one side, opponents of the pipeline are seizing on the fact that the new report significantly expands on its analysis of the overall climate impacts of any development of the tar sands. Some suggest that this offers strong grounding for Obama to reject the project’s permit. “In this report, for the very first time, the State Department acknowledges a scenario in which the Keystone XL tar sands export pipeline dramatically increases carbon pollution,” Larry Schweiger, president of the National Wildlife Federation, said Friday. On the other side, a broad spectrum of business leaders, conservatives and unions has backed the Keystone project from the start, on grounds of energy security and jobs creation. Perhaps the most striking analysis of the implications of the new report is offered by the oil industry’s jubilant reaction. “This final review puts to rest any credible concerns about the pipeline’s potential negative impact on the environment. This long awaited project should now be swiftly approved,” Jack Gerard, president of the American Petroleum Institute (API), a prominent industry lobby group, said following the report’s release. Meanwhile, the State Department’s inspector-general is continuing to weigh evidence of alleged conflicts of interest behind the agency’s review process for the Keystone XL project. A contractor heavily involved in both State Department analyses and a London group called Environmental Resources Management, is accused of being part of multiple trade associations that have lobbied in favour of the Keystone project, including the API. Two audit reports by the inspector-general are currently pending publication, expected to be released in coming weeks.